Jaipur is well connected to Delhi and all major cities of the country through rail including Ahmedabad, Alwar, Mumbai, Bangalore, Hyderabad, Pune, Gurgaon, Kolkata, Chennai, Coimbatore, Nagpur, Chandigarh among others. The Palace on Wheels, the luxurious train of India also has a planned stop in Jaipur. 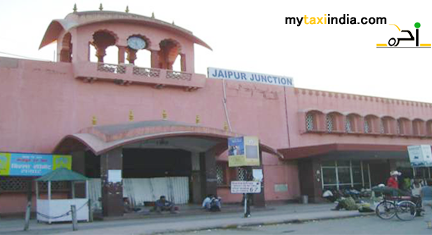 Booking a taxi will make your Jaipur tour comfortable and more enjoyable. Planning a visit to the marvellous city of Jaipur? At My Taxi India will help you enjoy the most pleasurable, safest, and convenient tour. We wish you a memorable trip to capital city of vibrant Rajasthan. We would help you create some amazing memories that you can cherish for a lifetime. Our fleet of cars are equipped with the latest equipments and amenities to make your tour a pleasant affair. Our chauffeurs will be at the appointed place and time as soon as you book our services. They are well trained and highly experienced in the field.